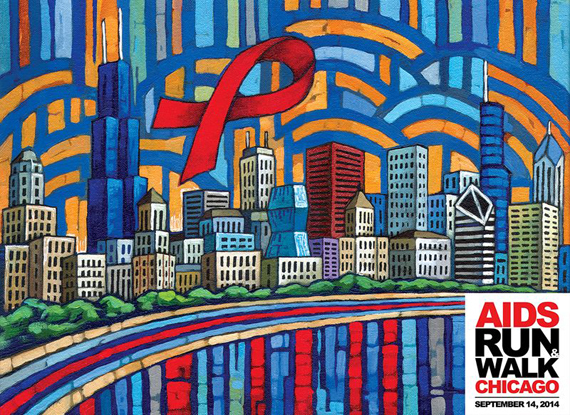 This summer, I was honored to have been approached by the AIDS Foundation of Chicago. They requested to have my artwork on a t-shirt, which will be gifted to the top fundraisers participating in the 2014 Run & Walk event on September 14th. Together, we collaborated on this image idea. I went on to create a piece representing our city, with my typical patterned background, and included the symbol of a fight against AIDS – a red ribbon – in the sky. Horizontal lines along the lake represent diverse crowds of people that will participate by running or walking during this event. 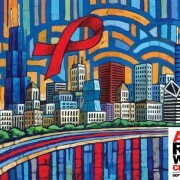 My painting, Chicago Skyline With Red Ribbon, was then silk screened onto AIDS Run & Walk t-shirts this week. I have known several people who have been affected by this disease and am very happy to contribute towards its fight in such a unique way!